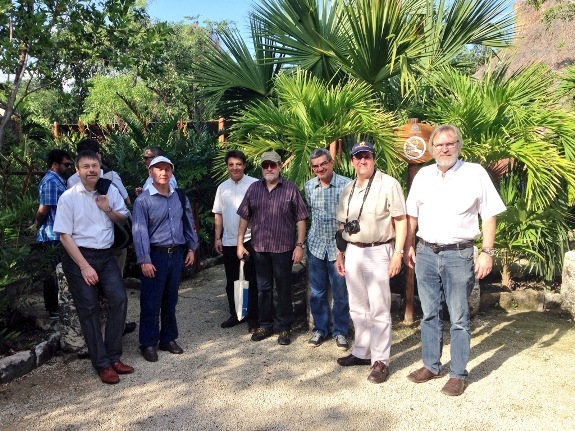 Sunset World recently welcomed a select group of international researchers to Hacienda Tres Rios as part of the project EXCEED, to discuss solutions to avoid a shortage of drinking water and other problems such as pollution, sanitation and sustainability in coastal areas. During the 5th Annual Latin American Meeting, Mexican experts joined participants from Brazil and Germany to analyze the water supplies of mega cities, coastal area engineering and aquatic ecosystems. Hacienda Tres Rios was selected to host the prestigious meeting due to its recognition as a model of sustainable tourism and diverse technologies for water conservation, including the capture and use of rain water and water treatment plants and desalinators. “On behalf of all of the EXCEED meeting participants, I want to express our thanks for all of the generous attentions we received from the staff of Hacienda Tres Rios. Without a doubt, the results of the meeting were excellent and we all enjoyed the hotel installations very much: The climate, cloudy during work days but sunny for our day of rest,” said Engineer Rodolfo Silva, one of the scientists attending the meeting. Among the objectives of the researchers on an international level is the development of basic proposals for the sustainable management of water, including technologies for the multiple uses and re-use of water.